Dog Gone Happy: Thank-you Dazzle! I can't help but wake up with a smile on my face each morning thanks to Dazzle. His joy in the start of a new day is contagious. 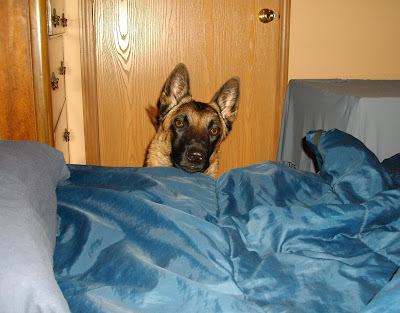 Each morning is the start of a new and fun adventure for him and he can't wait for me to get out of bed to join him. He HAS learned that trying to wake me up before I'm ready, however, is a bad idea. So he waits patiently to hear me stir and if Mike gets up first, he will often skip breakfast to wait in the bedroom for me to get up. This morning was that situation. I was laying on my side and before I moved, I opened my eyes. What I saw was a smiling Dazzle face about 3" from my nose and as soon as my eyes opened his whole body started to wiggle because his tail was wagging so fast. He held that position for about 2 seconds, big grin on his face, then stuck his nose into my eye (which thankfully I had closed) and held it there for another 2 seconds, like he was marking the behavior he liked :-) "YES mom! That's what I wanted to see!" Then he jumped up and gave me a full body hug by laying lengthwise on top of me and nuzzling his nose into my neck, tail going a mile a minute. His joy that I was awake and the day would be starting was clear, as it is every morning. Even on days when I wake up hurting I can't help but smile at his joy and devotion. He stays in the bedroom with me till I am ready to face the day and we walk out together. So thank-you Dazzle for helping to make me want to get out of bed, and doing so with a smile on my face. Even on cold, windy, snowy mornings when prior to his arrival I would likely have just wanted to stay in bed and only reluctantly and grudgingly gotten out of bed to have a bad day.